UPDATE: 6:23 AM EDT, Friday, Sept 9, 2005: The deadline has passed and I have the totals. This gives us a total of $10,000 for Red Cross Katrina relief (and a few other Katrina charities that those making donations or pledges had specified). If you pledged a match, please make your donation for the full pledge now … I’ll cover the PayPal transaction cost difference. When the pledges are in I’ll make the charitable donations, and note that I’ve done so here. It’s more than I thought we’d raise. 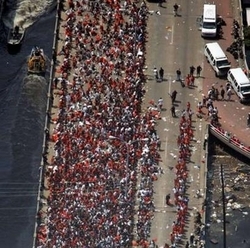 Thanks for helping with Katrina relief, and thanks for working to strengthen the good! I’ve been traveling hard for a few days, arrived home late last night, and am typing this in a bit of an early morning fog. So please forgive me if I’m less than lucid. One of the first charities Strengthen The Good highlighted was a matching grant for Hurricane Charley victims on Florida’s gulf coast. That was only a year ago, and at the time, the effort was relatively novel – other than listing possible charities, STG was one of only a few organized responses to the disaster in the blogosphere. Today, September 1, 2005, the blogosphere responds to Katrina with the Hurricane Katrina Blog for Relief Day. The day, hosted by one of the blogosphere’s leading technical lights, N. Z. Bear, involves bloggers around the world highlighting a particular charity of choice for their readers … doing good through information as much as donation. It is, in essence, STG writ large, and it is a good and fantastic thing. It also dovetails nicely with my decision of how to use STG to help salve the human suffering along the Gulf Coast, something I’m calling Matching The Good for Katrina Relief. When I selected the Charlie charity last year–The Gulf Coast Community Foundation Of Venice Hurricane Charley Disaster Relief Fund—the primary reason for the selection was the fund’s willingness to match total contributions up to $250,000. This year, at least so far, it seems the matching programs I’ve been able to find for Katrina are all corporate – employers matching the contributions of their employees to a corporate fund. If you’re a fan of STG, make a donation via the donation button over there in the right-hand column (we accept PayPal and credit cards) and I’ll match the total of all donations made by Midnight of next Monday night, up to a thousand bucks. If you’re a REAL fan of STG, don’t just offer to make a donation, offer to add to my match level. I’ll take all comers who want to join my challenge donation through this page. So, for example, if you say “Sure, I’ll add $100 to your challenge,” STG will then match all donations up to $1,100 rather than $100 – I’ll add your donation to my match. If you’re interested in joining my challenge, email me at alan at strengthenthegood.com. What I suggest is that other bloggers with PayPal accounts do the same: Pick a charity and a donation level you’re willing to match, and then challenge your readers to contribute. It doesn’t have to be $1,000 – pick $50, and ask that five readers contribute $10 each (or that 50 readers contribute $1 each). When next Monday night comes either make the total donation to the charity yourself on behalf of you and your readers, or if you like (or if it’s easier for you), make it to Strengthen The Good: this is a fully tax-deductible charity, and we’re giving all donations collected here to the Red Cross Katrina relief efforts. And that’s the idea: Don’t just strengthen the good, match it. If you go this route, please email me (again, alan at strengthenthegood.com) so I can keep a total of who’s participating and the totals matched. I’m in for $1,000 and I’ll match all donations until I’ve raised $1,000 for the Red Cross 2005 hurricane relief fund (and more if you want to join my challenge). You? * Chris at Political Musings has added $100 to the kitty. Thanks, Chris! * Jake Richter is in for $250 … thanks, Jake! * The superfabulous Rebecca Blood is in for $200 … thanks RB! * Friend and colleague Jan is in for $250 … thanks, Jan! * My brother- and sister-in-law, Gene and Kris, are in for $250 … thanks, guys!! * FB Antiques is in for $50 … thanks, Marcia! * Josie from Bonaire is in for $250 … thanks Josie (and enjoy a meal at It Rains Fishes for our family, will you?)! * Sue Cline is in for $100 … thanks, Sue! * Friend and colleague Carolynne is in for $250 … thanks, Carolynne (and Erik)!! * Some very generous friends in Dallas are in for $500 (!!) … thanks, friends!! * Pacific Rescue is in for $250 … thanks, folks!! * Mary is in for $1,000, asking that her part of the match go to these charities: $200 to the Salvation Army, $200 to UJC, $200 to the Southern Baptist Disaster Relief Fund, $200 to Feed the Children, and $200 to Soldier’s Angels. Will do, Mary, and thanks! * Richard is in for $100 … thanks, Richard!! * Jill is in for $450 … thanks, Jill!! We’ve also received donations: $4,096.38 so far … so that’s $8,192.76 for Katrina relief. And for those who have already donated, you know who you are, and thanks for helping to strengthen the good. If you’ve made a donation, please log it at TLB’s contribution page; it feeds into another page that keeps a running total of the contributions raised through blogs to date. For those who contributed before 11:00 AM EDT on 9/2/05, I’ll log your contribution for you as a single, group contribution. UPDATE - 7:45 A.M., Sept. 6th: Donations and matching pledges continue to come in, so I’ve extended the deadline for both thru midnight Thursday night, Sept. 8th. If you haven’t already, help those hurt by Katrina through a donation or matching pledge. It doesn’t have to be a lot of money … even $10 will help. Also, as you can see, our donations nearly equal our match pledges, so if you’re of a mind to add to the match kitty, now would be an excellent time. Either way … by donating or by matching, thanks for helping us strengthen the good! Link to Reynold’s charity roundup (and thanks, Glenn, for the link). Do what you can to help out. If you’re a fan of STG, make a donation via the PayPal account and I’ll match the total of all donations made by Midnight of next Monday night, up to a thousand bucks. Give a buck or two. For constant coverage, Michelle is right on top of everything. Salvation Army Wizbang flood aid Hurricane Katrina Matching the good I donated what I could this morning. Please help out by donating to your charity of choice…. There is a persistent need in all parts of the United States for well-built, affordable housing. That need has increased beyond imagining in the parts of Lousiana, Mississippi, Alabama and beyond that Hurricane Katrina has devastated. As I have family in Louisiana, the devastation of Katrina hit close to home. Fortunately, my family escaped the worst of it, but others weren’t so lucky. 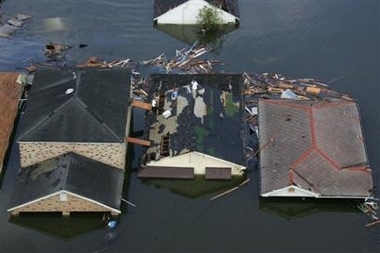 As I have family in Louisiana, the devastation of Katrina hit close to home. Fortunately, my family escaped the worst of it, but others weren’t so lucky.